ELIZABETH CITY, NC - Today Ram Truck and the FCA Foundation announced the donation of $100,00 to the First Response Team of America, which is now delivering recovery and relief support to residents in flood-stricken central-Texas communities. 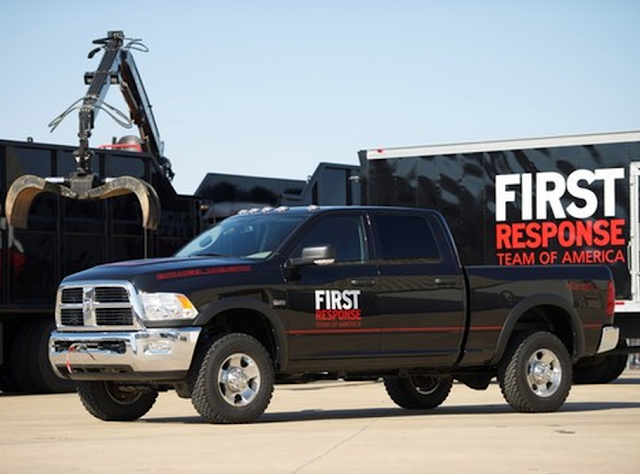 The First Response Team of America is a disaster relief organization, which, with their fleet of Ram vehicles, will be on-site to deliver supplies and give aid to those in need near the flooded area in central-Texas. Bob Hegbloom, President and CEO of Ram Truck Brand, US states that, "Ram Truck and the FCA Foundation are committed to helping our friends in these Texas communities get back on their feet and on the road to recovering from the devastating floods. In Texas and across the nation Ram truck owners are the kinds of neighbors who are ready to lend a hand when you need it most." Since 2012, when Ram partnered with the First Response Team of America, the automaker has donated more than $300,000 to First Response. Ram Truck and the FCA Foundation announced the donation of $100,00 to the First Response Team of America and as a result of their continued support; Ram and First Response have led similar relief efforts in Tupelo, Miss. and Moor, Okla.
For more information on Ram Trucks, feel free to stop by or take a look at our online inventory! Perry Auto Group has two dealership locations to serve you better at 1005 W. Ehringhaus St, Elizabeth City, NC, 27909 or 1001 Halstead Blvd Elizabeth City, NC 27909. Feel free to call us with any questions at (252) 338-9100.